There are few singers with such a gravelly voice I enjoy as much listening to than Grayson Capps. This started with an album somewhere in the mid 00s, enhanced by shows in Q-Bus, Leiden. One solo and one with The Stumpknockers. And then Capps disappeared from my hearing as sudden as he came into my life. Who else then Erwin Zijleman pointed me to the fact there's a new album called Scarlett Roses. That one is mine to review on this blog, thank you, Erwin. On first listen Grayson Capps delivers instantly. His slow voice makes its way over country rock and slow, Stones style rockers. The kind of songs I love to hear from this singer. Capps turned 50 last year and was slow in establishing his career. One album by a band called 'Stavin'Chain', released in 1999. His first solo album dates back to 2005, 'If You Knew My Name', containing the song 'Lovesong For Bobby Long', from the movie with the same name based on an unpublished book his father had written. His third studio album 'Rott 'N' Roll' was released in 2008; and then silence for many years. Now I find out I missed an album in 2011 and his show in November last year in Leiden, but I guess he'll be back someday soon. On Scarlett Roses all fans of Grayson Capps are immediately reassured. The sound is deliciously familiar, the quality all one can desire to hear. The rock that infuses his Americana songs gives them body and soul. As solid as I remember the show in Q-Bus, almost 10 years ago, I notice. Time sure flies. Taking Scarlett Roses all in I notice how at ease Capps is in the genres of Americana he chooses to play on his new album. Whether tending to a more country feel as in 'Hold Me Darlin'' or sleazing in a dirty rocker like the 8 minutes plus song called 'Taos', he dominates the songs and is totally at ease in them. That sounds logical for an artist to be in his own songs, yet it is only noticed when an artist like Grayson Capps shows his ease so self-evidently. In 'Bag Of Weed' there's some 'Beast Of Burden' guitar playing. The guitar solo the only forced sounding thing on this album. There may be a few words too much in the song as well. Compared to 'Bag Of Weed' the relaxed swing of 'You Can't Turn Around' comes over so well. The volume goes up a bit, a lead guitar explodes and the song goes off. The same goes for 'Thankful'. Whether for sunshine of moonshine. The smallest song of the album, 'New Again', fits him like a glove. 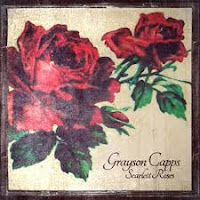 Another of Capps' fine songs on Scarlett Roses. There's nothing new going on on Scarlett Roses. It is Grayson Capps doing his thing a that absurdly fine level he is used to sing his Americana country/rock in. Things do not have to change, really.